Here are some suggestions for completing the steps. 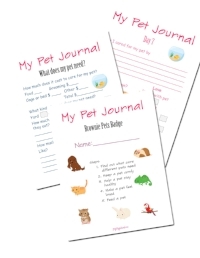 At the beginning of the meeting I passed out the pet journal to each of the girls. They were to complete this at home and if they didn't have a pet they could used a stuffed animal. This is a great activity to have them follow up with what they learned and take ownership. Make a collage. Make a welcome home kit for a specific animal. Use magazines or online pictures to put together a collage of what your pet would need the first day home. You can also use pet store sale ads. Have girls bring small pets (if they have any) to a meeting and share how they care for them. We had a girl bring in all her frogs, lizards, and a bearded dragon! They got such a kit out of it! Put on a pet fair! Have the girls pick a pet and create a presentation board. Field Trip Idea: Take a visit to a pet shop and calculate the costs. Field trip: Visit a pet hospital. Build a small pet obstacle course. We also used the suggestion from the VTK and made mini obstacle courses for small pets. You can use items from around the house: construction paper, clothes pins, pipe cleaners, toilet paper rolls, ect. The girls really enjoyed this activity! Braided sock ropes: For this step our troop created pet toys!! We "used resources wisely" and took old socks (mismatched or holes) and cut them up to make braided dog toys. The girls each brought in three socks. While the meeting started I had one adult volunteer cut the socks in half to double the length. Make a feeding schedule for a pet. Dog treats: There are plenty of dog treat recipes on Pinterest through a simple search. I've included a few for you below and a peanut free option! Posted on May 3, 2017 by Katie D. and filed under Girl scouts and tagged girl scouts Brownie badges brownies pets badge badge earning.